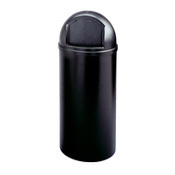 Rubbermaid® Marshall® Waste Container, Brown, 15 gal. Home » Swish Global Index » Miscellaneous » Rubbermaid® Marshall® Waste Container, Brown, 15 gal. Practical good looks and fire safety combined. Secures and conceals polyliner bags. Helps minimize appearance of surface scratches.